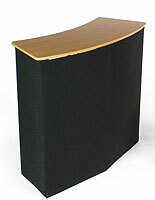 Pop up counter sets up in just minutes! Includes convenient rolling carrying case for easy transport! Hook-and-Loop receptive fabric to display supporting materials! Inner shelves provide ample storage space! 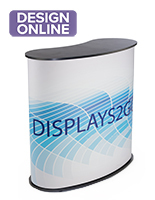 This pop up counter is very convenient for businesses that often travel to trade shows, sales meetings, or other promotional presentations. 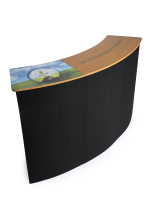 The black fabric pop up counter is designed to be easily portable, making it perfect for a wide variety of promotional applications, including in-store displays, such as grocery 'free sample' promotions. 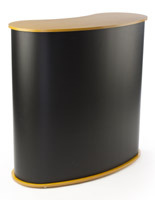 Temporary setups, such as ticket booths at school sporting events or holiday attractions, are another great place to use this black pop up counter. 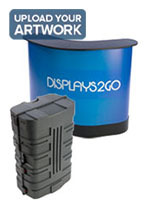 The pop up counter, also known as a trade show display, is well-equipped with many great features. 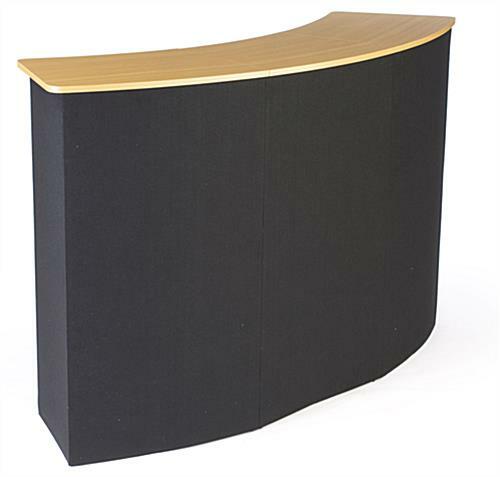 This pop up display stand, pop up counter features a slightly curved, wooden finish MDF counter area just over 5 feet wide. Under this counter, inner shelves provide storage area for promotional product samples, supporting literature, snacks, beverages and more. 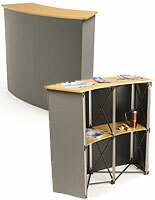 The counter is constructed from a lightweight, yet sturdy, aluminum pop-up frame covered on three sides by magnetically attached black hook-and-loop receptive fabric. You can affix a variety of hook-and-loop accessories, like literature holders, to enhance your trade show booths' presentation. 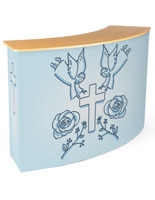 This pop up counter even includes a portable carrying case with wheels and a handle, as well as carrying straps, so it can be rolled behind you or carried. The counter is super easy to setup despite the not very specific directions included. A little heavy but not too bad. It's definitely not a flimsy counter but it might not last forever. I will definitely be careful when constructing and deconstructing. I think this will save us a huge amount of money in the long run! Thank you for your feedback and for sharing your images with us, Allison! We value your insight and have passed this along for our product team to review. We aim for our customers to have complete confidence in their purchase. Thank you for sharing your thoughts with us. 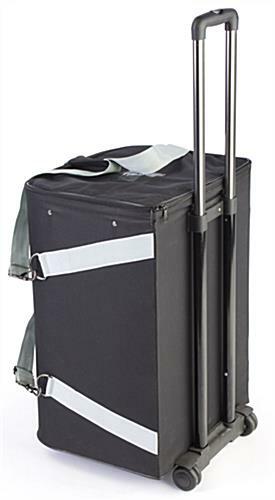 Great rolling/carry case that fits easily into car for transport. Magnetic components makes setting up the counter quick and easy. 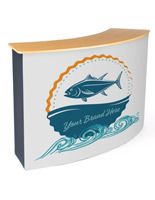 Adding our company logo banner to the front gives it a professional look. Would like the top wood-like counter pieces to connect better somehow. There is some movement with the top wood parts since it is in two pieces. We are sorry that you're having some issues with your item, Matt. A customer care representative will contact you promptly. The first one I got was of poor quality - one of the panels had a broken support hook and another could not attach straight no matter how hard I tried. I give 5 stars to Displays2go for their excellent customer service making this right with a replacement. I still doubt the durability of the unit and how long it will last. There's a couple elements that seem like bad design shortcuts. For example, the front and side panels attach with 2 very small plastic clips and I see these breaking at some point - these really should be made of metal for durability. Also, the panels roll up to fit into the case for storage. The problem with this is that they naturally want to curl back up, so they often don't stay flush with the frame, creating some gaps which result in a less-than-perfect appearance. The frame itself is surprisingly durable and very smartly made to set up in minutes. And the case is very durable and should hold up no problem. We're sorry to hear that you're not totally happy with your order, Ryan. One of our customer care representatives will reach out to you promptly. I bought this table for use for my mobile bar business. 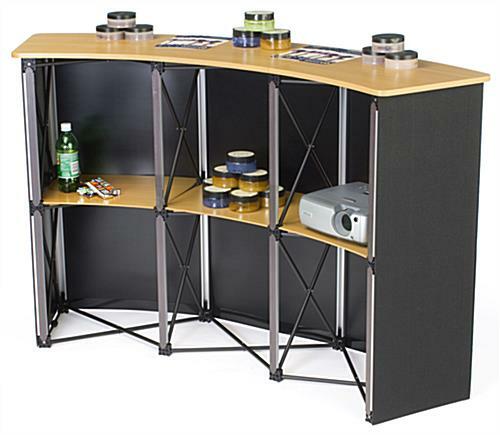 All portable bars I came across were very expensive and when I seen this affordable setup I had to purchase. I do not regret the decision, it's working out perfect for my business. That's great to hear, Joe! We are glad you're so happy with your product. Feel free to share you review and photo on our Facebook wall! We love it when our customers show off our products in action, and we also provide weekly coupons and discounts via social media that you may be interested in for the future!